February is Heart Health Month! Heart disease is the leading cause of death for both men and women. 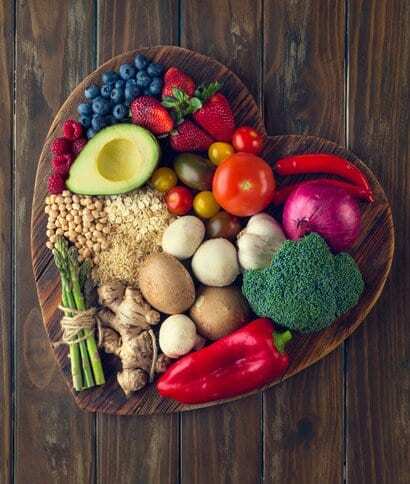 One of the most important things you can do to increase your heart health and decrease your risk for heart disease is to take a look at your diet. Are you eating the foods that are good for your heart and sparingly consuming the foods that aren’t? Here are five questions to ask yourself about your diet. How much sodium are you eating? Hypertension or high blood pressure is a major risk factor for heart disease. One of the best ways to decrease your blood pressure or to prevent high blood pressure is to watch the amount of sodium in your diet. It's in everything these days. However, it is not in fresh foods such as fruits and vegetables, and lean meats. The worst foods are those that are typically processed and packaged, and food when you are dining out. When grocery shopping, try to stay on the outside aisles of the store and avoid purchasing a lot of items down the center aisles. This tends to be the area where the higher-sodium foods are located. Try to decrease how many times you eat out per week. When you do dine out, be sure to drink plenty of water to help flush out the excess that is bound to be in your food. Are you choosing low-fat animal protein sources? Saturated fat is the fat that is found in animal products and is directly linked to elevated cholesterol and increasing the risk for heart disease. Most individuals get their protein from meat, resulting in high saturated fat consumption. The best way to watch the amount you are taking in is to choose lower-fat protein sources such as those from fish that is grilled or baked, white-meat chicken and turkey without skin, center cuts of pork, and lean cuts of red meat such as filet or sirloin. Are you eating fruits and veggies with every meal? Prepare them any way you like, and shoot for a few portions at each meal. Toss fruit into your oatmeal or yogurt and add veggies to your eggs at breakfast. At lunchtime it’s easy to grab a veggie as your side to your sandwich. Fruit is an easy and portable snack any time of day, and half of your plate should be covered with vegetables at dinner! These nutrient powerhouses are loaded with fiber. Fiber helps to decrease the cholesterol in your body, which can be very heart protective. Where are the high-fiber carbohydrates? Carbohydrates have gotten a bad rap in recent years, mainly due to the increased intake of highly processed and unnatural carbohydrate sources. Carbs are important and help supply the body with energy it needs to run various systems of the body. Portion control is key here (1 to 2 cupped-hand-sized servings) and so is choosing the kind of carbohydrate. Choose whole grains, beans, lentils, and fruits that are unprocessed the majority of the time. Are you eating the right kinds of fat? Fat in your diet is important; however, the type of fat you are choosing is key. Remember that animal fat is the not-good-for-your-heart fat, along with foods that are packaged to have a long shelf life and those that are deep fried. The good fats are those from vegetable sources such as nuts, olive oil, avocado, and fatty fish like salmon. Choose these types of fat the majority of the time, being aware of portion sizes though, since they carry a lot of calories with them also. If you have a family history of heart disease, you should definitely be asking yourself these five questions and working toward healthy eating habits. Take time this month to reflect on your heart health, decrease your sodium intake, and increase your fiber and good-for-you fats!